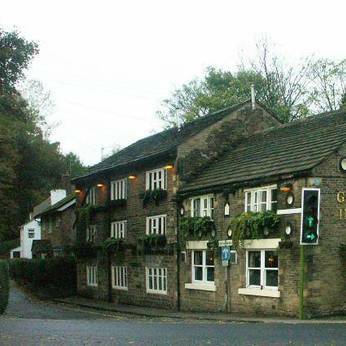 The Gun Inn is a friendly local pub situated in the village of Hollingworth. The building dates from the mid 1700's and some of the staff do too! The friendly bar is open daily from 12 noon, with a popular Friday night Karaoke, and live artists many Saturdays. Pop in for a pint of your favourite real ale, Fosters, Sagres and many other drinks on draught, all at fantastic prices. Home cooked food is served daily from 12 noon until 9pm daily in the bar, and with meals from £3.95 it's certainly worth a try! All food is fresh and as much as possible is sourced locally. We also have ever changing fresh specials. The restaurant is the perfect place to hold a function with NO ROOM CHARGE and buffet menus from £5.00 per head, and set menus from £8.00, and if you don't like that sound of that tell us how much you want to spend and we'll do the rest, working to your budget. The restaurant is open all day on Sundays with our fantastic value 3 course Sunday Lunch menu for £9.95 per head. We hope to see you at the Gun soon. Fed up of waiting in all day for the postman to come with a DVD, or waiting for a courier to drop off a gift, (and they're always late! ), well we now have the perfect solution for you! Enjoy authentic home cooked Thai food either in our Thai themed restaurant, 'Ra Beang' or in the comfort of your home with our new take away option. Both the restaurant and take away are open from 6-9.30pm Thursday to Sunday.